Our school is located near an oak forest and an orchard, so we are in a perfect spot. At first, juncoes were our main birds. Now, we have seen chickadees, cardinals, tufted titmice, house finches, mourning doves, and English sparrows. Students have been able to engage in long-term investigations with the bird feeder. As they have looked at the data over time, students have come up with some generalizations. "We see more birds on rainy days than on sunny days," one student said. Another said, "We haven't seen the juncoes in awhile. They must be winter birds." I made an observation binder to keep track of what we see. It will be interesting to compare data across the years to see what changes we can notice. Is the bird feeder too distracting? I know that I sometimes stop mid-sentence and say, "Hm, the chickadee is here right now." However, I've learned that practice in switching attention back and forth can really help students to focus. 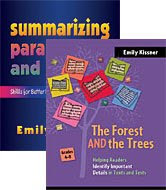 (I wrote more about this in my book, The Forest and the Trees: Helping Readers Identify Important Details in Texts and Tests.) Being able to look up at the bird feeder, see what is there, and then focus back on the task at hand is important for students. 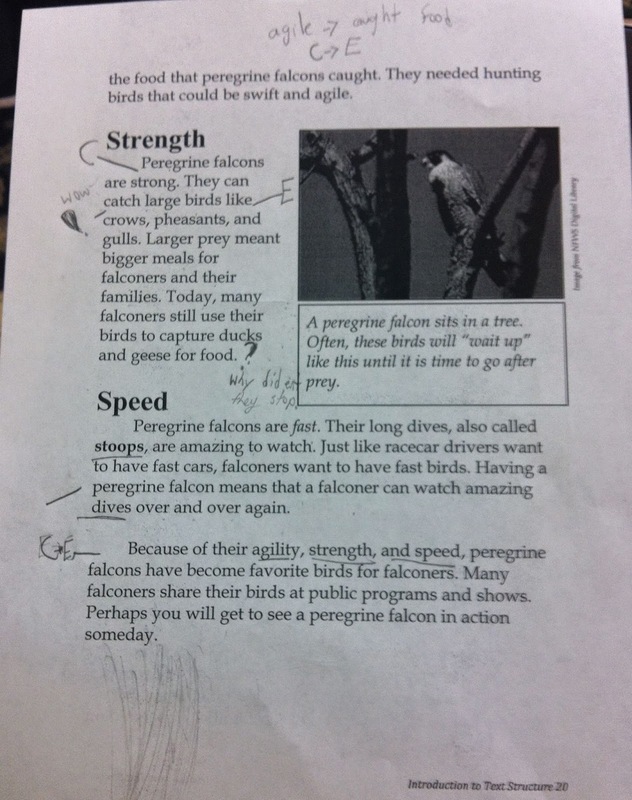 Kids use many different kinds of resources to identify the birds. I have put up the Ned Smith posters of Pennsylvania birds and animals, which are a handy resource. (I started out by using them to decorate the walls during state testing, and then left them up.) I also have several bird books on the windowsill. Students have gone from saying "What is that black bird?" to asking "Is that a starling or a crow?" But students, like people in general, like to learn through social interaction. Students share what they know and quickly tell students from other homerooms what the different birds look like. "Oh, the brown one with the orange beak is the female cardinal!" Several of them have become more interested in birds in general, and now are observing birds at home as well as at school. They compare stories when they come in and ask more questions: "Mrs. Kissner, do kestrels live around here?" or "___ said he saw a peregrine falcon. Do you think that can be true?" One day a student brought in a camera from home to take photographs of the birds. 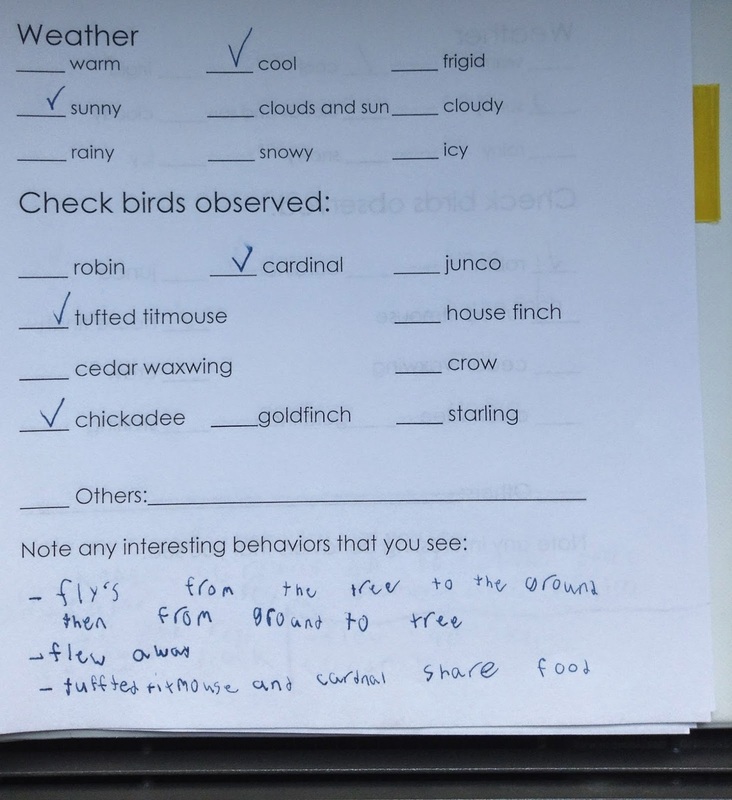 The student shared the camera throughout the day and the students took turns trying to capture the best images of as many different birds as they could see. They scrolled back through the image file and compared their pictures: "That one is the best one of the junco," and "I never noticed that the tufted titmouse had that orange part!" About ten years ago I realized that I could write my own resources to use in the classroom. The process at first was grueling--it would take me weeks to plan, write, and format one informational article. I'd like to think that I can now move through the process a little more quickly, but it still requires a particular mindset to accomplish. Luckily my husband has been one of my best critics and my best advocate. Last week, he asked if I could write some materials for his enrichment group. They are a lively, intelligent bunch (and my son happens to be in the group!) Knowing about my son's current love for mythology and ancient history, I wrote a series of readers theater scripts about ancient Rome. I was excited for my son to read them. "What did you think of the scripts? "I asked on our way home. "You wanted the smallest part?" I asked, a bit surprised. "Of course. I always want the smallest part," he answered. "But you need to put fluffy bunnies in all of the scripts. It would be so easy." I pressed him a bit more to see if he had learned anything from the scripts (which was after all the point), and he rattled off details about the different jobs of ancient Rome. "But they all need fluffy bunnies," he persisted. So I added the fluffy bunnies detail to all of the scripts and resolved that next year, when he was in fourth grade, I'd have to make sure that he didn't always get the smallest part. -Roman Readers Theater is available if you are interested. -I've added a new text (Water Pollution) to the Cause and Effect unit. If you've already purchased it, you can re-download it for free, with the latest updates. One of my favorite parts about reading is the way that readers constantly go back and forth between the micro and the macro. At the micro level, readers think about words and ideas; at the macro level, readers think about the overall structure of the text and the main ideas. In the past few weeks we have been working on the micro level idea of using different transitions to connect sentences. This is so hard for fourth graders! Over five weeks, however, I have seen progress. Students are using "but" and "so" confidently, and are experimenting with more sophisticated transitions like "although" and "despite". Their experiments are not always successful, but they are becoming more aware of these words and the ideas they convey. At the macro level, we have been looking at text structure. We started with chronological order, and now we have moved on to cause and effect. But even when looking at the big idea in a text we still have to consider the smaller ideas in the individual sentences, and notice how some individual sentences carry big ideas. With this cause and effect text, students used specialized annotations to look for the sentences that show cause and effect relationships. These annotations brought up some bigger questions about the structure of cause and effect--why is it often in chronological order? How can we tell that something truly causes an event? I'm not really sure what led me to starting a STEM club at my school. Maybe it was watching my own children create with the Makedo set they got for Christmas. Maybe it was the excitement of my students as they experimented with Scratch after the Hour of Code. Or maybe it was the influence of the people I follow on Twitter. Whatever the reason, I wanted to offer something for students that goes beyond the typical sports and music offerings. I decided to start small by just making the club available for fourth graders. I also started with scheduling just four sessions--totally manageable! But what to do? I don't have any budget for the club, so I decided to work with easy to get materials and what I already have. These are the sessions that my oldest son and I brainstormed. Our first session went wonderfully. We started with about 10 minutes of downtime for students to eat the snacks that they had brought, use the restroom, work on homework, observe the tadpoles in my room, and chat. Then, we watched the NASA video, "What is engineering?" Before we tested their creations, I showed the "Success through Failure" video. This helped to cushion kids against the upcoming disappointment they might feel when their structures failed. After all, failure is good! We can learn from it! And this is the most important part: Then we did it all again. This time, kids could choose from more materials--clay, cardboard, straws, and whatever else they could dream up. The hour passed quickly and before we knew it we were cleaning up, talking about next time, and negotiating about what materials kids could take home to do more experimenting at home. I could hear the kids saying, "This was so fun!" as they went out into the hallway. The whole thing has turned out to be really fun. Hopefully our next sessions will run smoothly as well! Traditional Text or Digital Text? I've learned that it's great to read both! Read more about it in my post on the Frolyc blog. 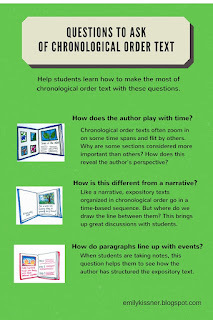 I usually teach chronological order text fairly early in our study of text structures. 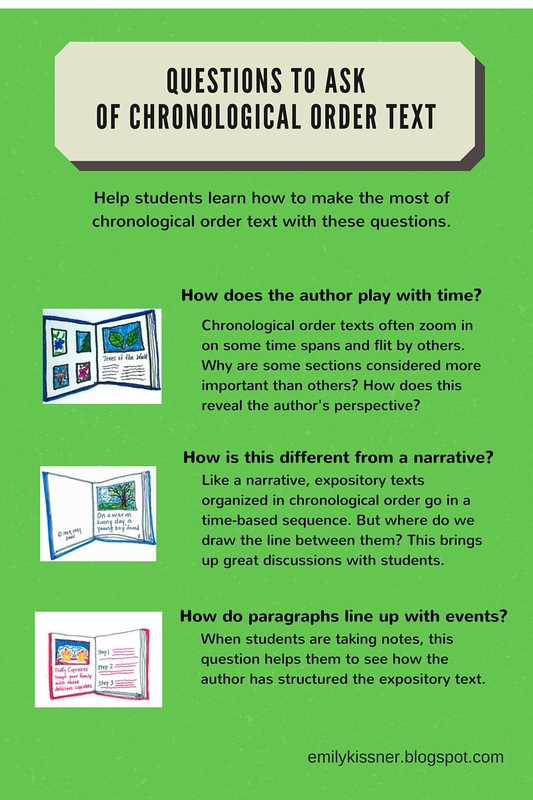 Students can draw on their understandings of narratives and their own experiences with time order to quickly build an understanding of this text structure. But this doesn't mean that chronological order text is simple. In fact, these texts often have deep complexities lurking beneath the surface. How does the author play with time? Comparing a timeline to a chronological order text is fascinating. While timelines have a regular, ordered interval between events, chronological order texts often zoom in on certain time periods while flitting over others. An event that is important to the sequence may have several sentences devoted to it, while a less important event may be glossed over in just one or two sentences. With a group of fourth graders, we looked at the use of time in "Lafayette and the Battle for Freedom." Lafayette's early years are discussed very quickly in the first paragraph. The rate slows down in the second section, however. Why? How does this match with the main idea of the article as a whole? Noticing these differences in fourth and fifth grades can help students to have more sophisticated discussions in upper grades. How does this use of time reveal an author's bias? Why might an author want to devote more space to a particular event? How is this different from a narrative? As you can see in the last post, my students really love reading about animals. Because we're doing a choice-based activity right now (Expedition Text Structure), they are happy to select animal text structure books for themselves. 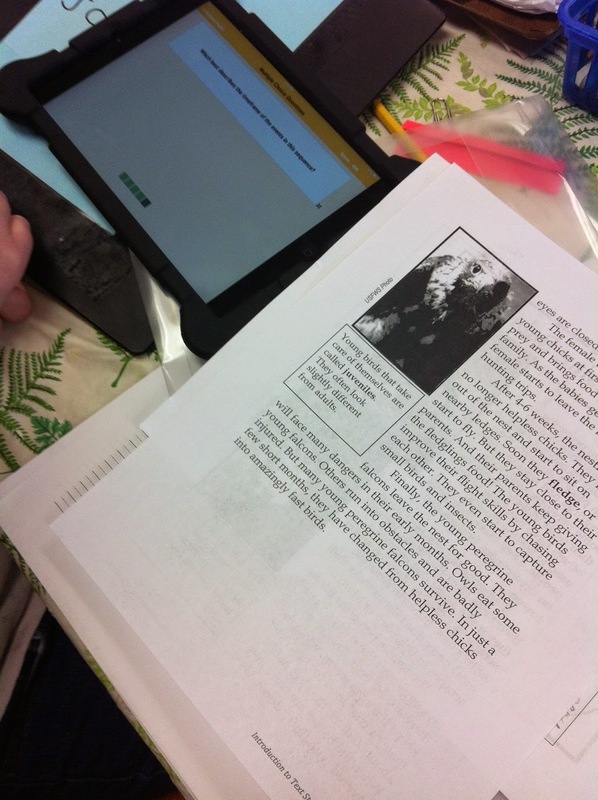 I've started to devote more read-aloud time to technology and history texts. We were reading Steam, Smoke, and Steel: Back in Time with Trains when a student said, "Wait. How is this different from a story?" How do the paragraphs line up with events? This question can lead to great discussions as students are reading. Many students will think that authors will use one paragraph for each event in a narrative. But this isn't always the case! Check out this text from my Introduction to Text Structure unit. Which paragraphs have only one event? Which have more than one? Why might this be so? As you can see, chronological order text can be fascinating to explore and discuss! 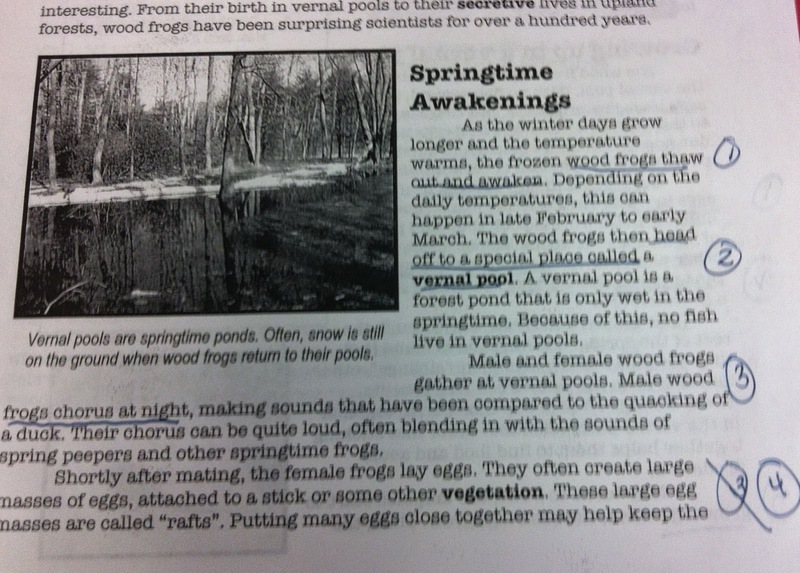 Today I shared a wood frogs text with a group of readers. I had selected texts for the class based on a quick interest survey designed by one of my fabulous colleagues. 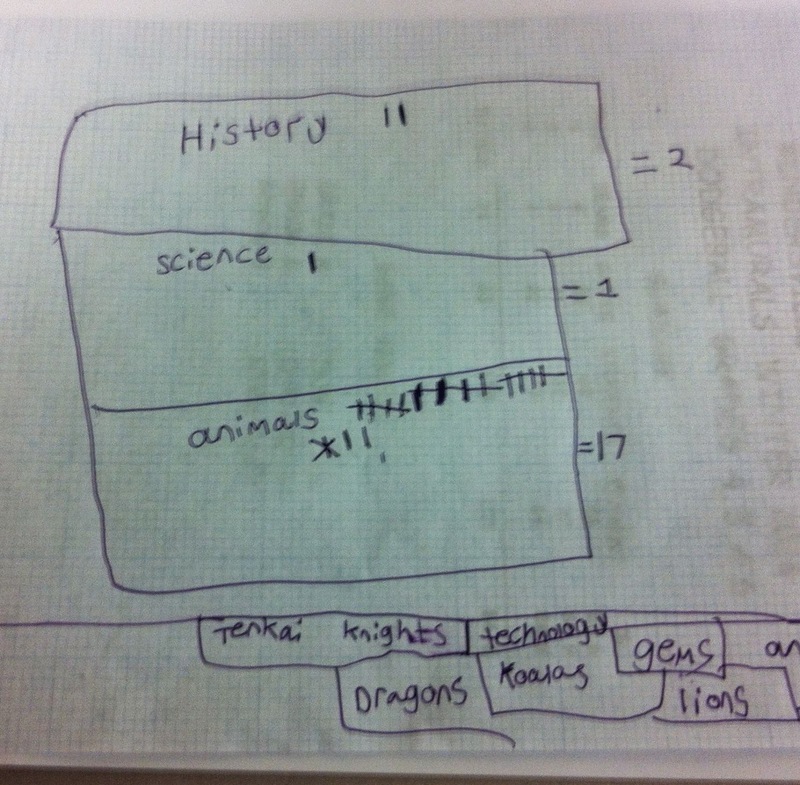 A student agreed to tabulate the results (for 10 coupons, our classroom currency) with these unsurprising results. In the small group, we started by looking at the text, especially the headings. "The headings don't really help you know the topics," one student mused. A quick note about this: Looking for these events is a fuzzy process. There may be multiple ways of considering what are separate events and what can be lumped together. 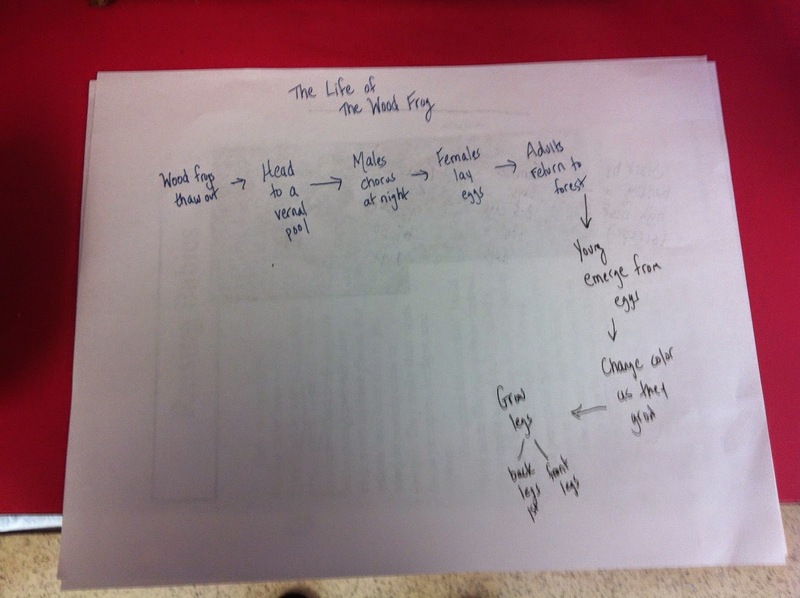 After all, I wrote the wood frog text and a student convinced me to change my mind about an event. Don't turn away from this fuzziness. If you're not sure about something, tell the students. "Would this be one event, or two? What do you think?" After we had our events underlined, making the graphic organizer was easy. I modeled the process of writing first and then putting boxes around the text. We also talked about how to change the wording and condense ideas. Notice that this is not beautiful, but quickly sketched and displayed with the help of the document camera. I love scaffolded summaries. If I were ever to be able to write another edition of the summarizing book, I would add a whole chapter about scaffolded summaries! These frames help students to see what the summary should look like while still giving them some work to do. Fourth grade readers are always asking, "How long should this be?" when asked to write a summary! So I introduced the scaffolded summary by asking students to count the sentences. How does this relate to the original text? Then, we went between the scaffolded summary and the graphic organizer. We explored which events were put together in the summary, and why. Then we filled in the blanks and read the entire thing. Some blanks could have multiple answers, while others required just one. A scaffolded summary is a good first step for summarizing chronological order text. Often, kids love the details of the text so much that they just can't discard any, and their summaries go on and on and on. Explicit teaching about how to combine events (also known as "collapsing lists") helps them to confront this tendency and try to avoid it. Our next step is for students to write the graphic organizer and summary independently. To give them some choice, I've set up a box with a wide variety of chronological order texts. They can browse the box and select the texts that interest them. -The wood frog text used above is available in Chronological Order Texts. Wood frog eggs are in vernal pools now and are great for the classroom! This year, I've been working on daily sentence composing with my students. Each week, students have been unscrambling, imitating, or combining sentences. I've been able to use this method to teach most of our grammar standards, including prepositional phrases, compound sentences, and subject/verb agreement. This is based on sentence composing and sentence combining research, with some key differences. First, I incorporated lines to help students improve their handwriting during these activities. Second, while many of the target sentences in other books are from literature, I wrote the sentences for this program. I hate the random examples on typical grammar exercises. It seems that students have to use precious processing power to reset their schema as they go from one sentence topic to the next. If the sentences are all based on one topic, then hopefully students will have more processing capacity to deal with the complexities of sentence composing. Writing these sentences was hard, but so worthwhile. I have a YouTube playlist for each theme, so students can see the videos during arrival, dismissal, and as transition activities. These videos reinforce the content in the sentences and add new vocabulary words, which students can then take into their sentences and paragraphs. Each week ends with a paragraph prompt inviting students to write on a topic related to that week's sentences. Often, students have to incorporate an aspect of the week's lesson, such as a compound sentence. Students then check their own work using a highlighter and a red pencil. Two weeks ago, I joked to the co-teacher in my room, "Well, thirteenth time's the charm!" We had just finished our thirteenth week, and the paragraphs were amazing! Students had to write about their experiences from the point of view of a fish--and they were able to read the prompt, figure out what to do, and weave in their own experiences. One student wrote that he was a shad in the Susquehanna River, using details from our migration simulation in his writing. Considering that I had students who responded in just a single sentence (or a single run-on sentence) at the start of the year, this is great progress.